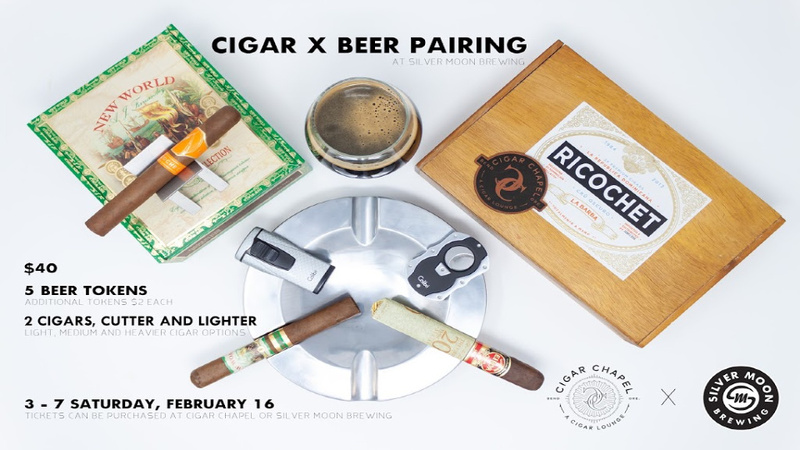 Silver Moon Brewing is pleased to have teamed up with their neighbors over at The Cigar Chapel to bring you a very special pairing event! This special event will take place on the Silver Moon Brewing Patio on February 16th from 3:00 – 7:00 PM. Professional Cigar expert and Owner of the Cigar Chapel, John Pugh, has carefully paired some of his most popular cigars with a list of delicious Silver Moon beers. We have options ranging from Barrel Aged to lighter lagers. Rest assured that there will be the perfect option to fit your style and taste preference. Tickets for the event are $40.00. Your ticket will include two different cigars, cigar cutter, torch lighter, and five beer tokens (5oz pours). Additional beer tokens can be purchased for $2.00 a piece. There are several different packaged cigar options that you are able to choose from upon your arrival. These include a mild, medium, and full bodied package. Our patio will be set up with a plethora of heating equipment from fire pits to heat towers to put you into the cigar and beer mood. We will also have our kitchen fully staffed and will offer food options throughout the event. Tickets are on sale now and can be purchased from either Silver Moon Brewing or The Cigar Chapel! Get your friends and come on down! You won’t want to miss out on this great event!